I made this for Jan 25th third memory protests. We didn’t get to raise it, since security and military forces started arresting people before we got to. The caption says:”Freedom for Loay Al-Kahwagi”. His name is Loay Al-Kahwagy. He was arrested for protesting during the trial of Khaled Saiid’s killers. 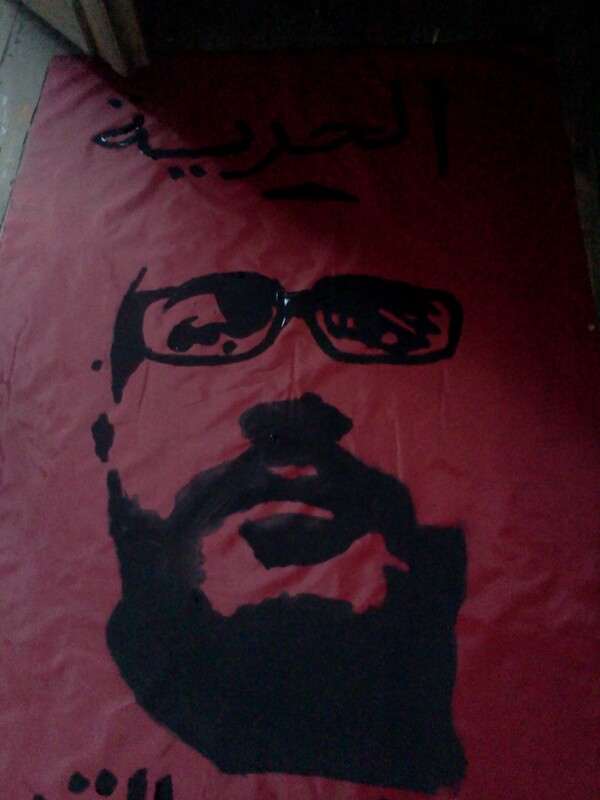 You may remember Khaled Saiid as the name that was most associated with the 25th of January, 2011 revolution. Khaled died from torture June 6, 2010. Loay was in fact protesting in front of the Manshiya Court, where the session was held. Police forces decided to break up the protest 10 minutes in, and started beating protesters. Loay was arrested trying to defend one of them. To be exact, he was arrested only after he asked an officer:”Where are you taking him?”, when that officer was already arresting someone. The officer responded:”Come with him then.” He has been in jail since(December 2nd, 2013), and was sentenced recently to 2 years in prison and 50k L.E(~$7k).